From left: Alan Kumamoto, Brian Kito, Steve Nagano and City Councilmember David Ryu. Los Angeles Mayor Eric Garcetti and members of the City Council presented the 2016 Clean Streets L.A. Challenge Awards during a City Hall ceremony on Jan. 14. The Monster Cleanup Award for Largest Cleanups went to Little Tokyo Public Safety Association in Council District 14 and Sun Valley Area Neighborhood Council in Council District 6. 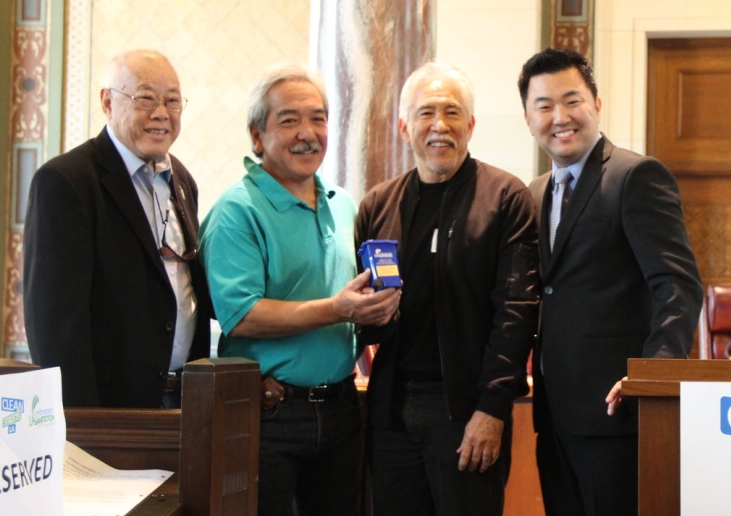 City Councilmember David Ryu presented the award to event organizers Brian Kito, Alan Kumamoto and Steve Nagano. Close to 250 people cleaned up First, Second, San Pedro, Azusa and Judge John Aiso streets and Central Avenue, plus Maryknoll, Zenshuji and Nishi Hongwanji, with still more volunteers working in the kitchens at Higashi Honganji and Teramachi to make lunch for everyone. The cleanup was dedicated to the late community leader Nancy Kikuchi. The NexGen Organizer Award for Youth Organizers went to Max Merlan with Boy Scout Troop 18 (CD 2), Reeyan Raynes with West Hills Neighborhood Council (CD 3), and Jeremiah Jones of J Youngin & Co. with Charity Mission Church Community Development Center (CD 15). The Spielberg Award for Best Cleanup Video went to Arroyo Seco Neighborhood Council (CD 1). The Marketing Master Award for Best Marketing Campaign went to “Parkemons” by Glassell Park Improvement Association (CD 1). The Game-Changer Award for Innovative Program: Clean Streets, Clean Starts went to Northridge South Neighborhood Council (CD 12). The 311 Superstar Award for Increased 311 Usage Within a Neighborhood Council District went to North Hills East Neighborhood Council (CD 6), 36 percent; MacArthur Park Neighborhood Council (CD 1), 34.8 percent; Boyle Heights Neighborhood Council (CD 14), 20.4 percent. Clean Streets L.A., launched in 2015 by Garcetti, calls for the city’s Bureau of Sanitation (LASAN) to lead various following efforts to clean the neighborhoods. For more information, visit http://cleanstreetsla.com.